• Sensitive and accurate. Linear detection range in 96-well plate: 1 to 100 mg/dL cholesterol for colorimetric assays and 0.2 to 10 mg/dL for fluorimetric assays. • CHOLESTEROL is a sterol and lipid present in the cell membranes, and is transported in the bloodstream of all animals. It is used to form cell membranes and hormones, and plays important roles in cell signaling processes. Elevated levels (hypercholesterolemia) have been associated with cardiovascular diseases such as atherosclerosis; whereas, low levels (hypocholesterolemia) may be linked to depression, cancer and cerebral hemorrhage. Simple, direct and automation-ready procedures for measuring cholesterol are very desirable. BioAssay Systems EnzyChrom™ Cholesterol Assay uses a single Working Reagent that combines cholesterol ester hydrolysis, oxidation and color reaction in one step. The color intensity of the reaction product at 570nm or fluorescence intensity at λex/em = 530/585nm is directly proportional to total cholesterol concentration in the sample. 2. In a 1.5 mL Eppendorf tube, mix 50 µL yolk with 450 µL of the extraction buffer. Vortex for at least 30 sec. 2. What is the principle of the E2CH-100 cholesterol assay? Cholesterol esterase cleaves esters into cholesterol, which is oxidized to form H2O2 in the presence of cholesterol oxidase. The produced H2O2 is measured with a specific dye Ampliflu in the presence of a peroxidase. 3. What substances are known to interfere with cholesterol assay? Reducing agents such as ascorbic acid and bilirubin interfere with peroxidase-dependent cholesterol determinations. 1. Rub A et al (2009). Cholesterol depletion associated with Leishmania major infection alters macrophage CD40 signalosome composition and effector function. Nat Immunol. 10(3):273-80. Assay: Cholesterol in Mouse macrophage, membrane (Pubmed). 2. Lee, SM et al (2008).GCG-rich tea catechins are effective in lowering cholesterol and triglyceride concentrations in hyperlipidemic rats. Lipids 43(5): 419-429. . Assay: Cholesterol in Rat blood (Pubmed). 3. Ponda, MP et al (2010). Moderate kidney disease inhibits atherosclerosis regression. Atherosclerosis 210(1):57-62. Assay: Cholesterol in Mouse blood (Pubmed). 4. Guevara-Arauza, JC et al (2011). Biofunctional activity of tortillas and bars enhanced with nopal. Preliminary assessment of functional effect after intake on the oxidative status in healthy volunteers. Chem Cent J 5(1):10. 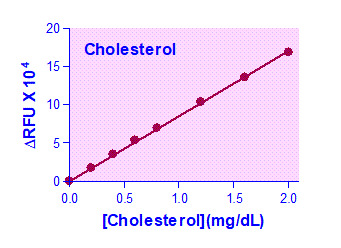 Assay: Cholesterol in Human Plasma (Pubmed). 5. Uddin, MJ et al (2011). Detection of quantitative trait loci affecting serum cholesterol, LDL, HDL, and triglyceride in pigs. BMC Genet 12:62. Assay: Cholesterol in Pig Serum (Pubmed). 6. Stoll, C et al (2011). Liposomes alter thermal phase behavior and composition of red blood cell membranes. Biochim Biophys Acta 1808(1):474-81. Assay: Cholesterol in Human Red blood cells (Pubmed). 7. Waheed, MM et al (2011). Some Biochemical Characteristics and Preservation of Epididymal Camel Spermatozoa (Camelus dromedarius). Theriogenology . Assay: Cholesterol in Camel Epididymal fluid (Pubmed).